#BRAOU MEd/ BEd/ BEd(SE) Admissions 2018 and #Counselling Schedule,call letters, Download B.Ed/B.Ed(SE) Admission counselling schedule -2018/ BRAOU Counselling Schedule for Admission into MEd/ BEd/ BEd(SE) Programmes for 2018, BRAOU distance MEd/ BEd/ BEd(SE) Counselling Dates, BRAOU B.Ed M.Ed course Admissions Counselling Schedule, BRAOU B.Ed and M.Ed Programmes Counselling Dates. 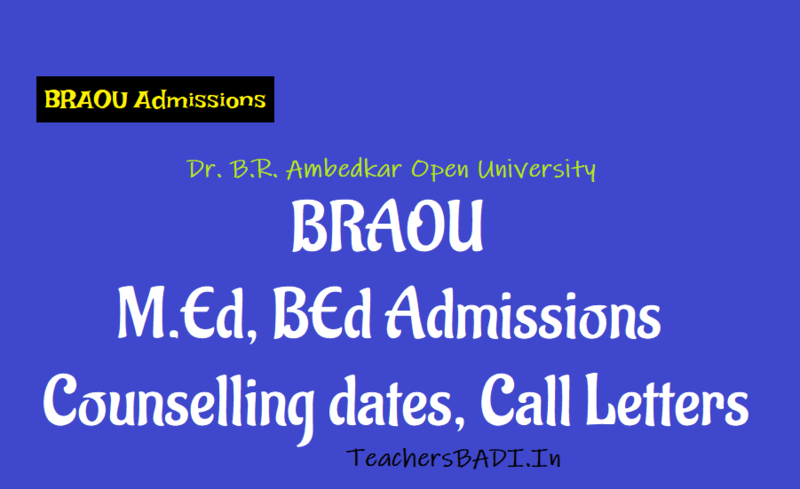 List of documents for certificates verification: BRAOU MEd/BEd/BEd(SE) Counselling Dates: Dr.B.R.Ambedkar Open University issued MEd/ BEd/ BEd(SE) Entrance Test notification for admission into M.Ed., B.Ed., B.Ed. (Special Education) Programmes in its study centres and all the programs offered by the university are recognized by the Distance Education Council (DEC), IGNOU, New Delhi. The BRAOU invited online applications through its University BRAOUONLINE Web Portal from the eligible candidates for admission into above mentioned programmes. Eligible candidates were applied for this admission stream. These entrance examinations were successfully conducted and after results were announced by this University. These results are also available on its braou online website. బీఈడీ ప్రవేశాలు(స్పాట్‌ అడ్మిషన్లు) అక్టోబరు 20న, బీఈడీ స్పెషల్‌ ఎడ్యుకేషన్‌ కోర్సు ప్రవేశాలు అక్టోబరు 22న నిర్వహిస్తున్నట్లు అధికారులు తెలిపారు. రెండు తెలుగు రాష్ట్రాల్లోని కళాశాలల్లో ఖాళీగా ఉన్న సీట్ల భర్తీకి ప్రవేశ ప్రక్రియను విశ్వవిద్యాలయం ప్రధాన కార్యాలయంలో నిర్వహిస్తున్నట్లు పేర్కొన్నారు. తొలుత వచ్చిన వారికి సీట్లు కేటాయించనున్నట్లు వెల్లడించారు. విద్యార్హత, ధ్రువీకరణ పత్రాలతోపాటు వాటి ప్రతులు, రుసుముతో హాజరుకావాలన్నారు. 1. అంబేడ్కర్‌ ఓపెన్‌ యూనివర్సిటీ అందించే బీఈడీ (ప్రత్యేక) కోర్సులో ప్రవేశాల కోసం ఈ నెల 19వ తేదీన వర్సిటీలో కౌన్సెలింగ్‌ నిర్వహిస్తున్నట్లు అధికారులు తెలిపారు. 2. యూనివర్సిటీ నిర్వహించిన ప్రవేశ పరీక్షలో అర్హత సాధించిన వారు మాత్రమే ఈ కౌన్సెలింగ్‌కు హాజరు కావాలని స్పష్టం చేశారు. 3. జనరల్‌ బీఈడీ కోర్సులో మిగిలిపోయిన సీట్లకు ఈ నెల 20న స్పాట్‌ అడ్మిషన్లు ఇస్తామన్నారు. 1. డాక్టర్‌ బీఆర్‌ అంబేడ్కర్‌ సార్వత్రిక విశ్వవిద్యాలయంలో 2018-19 సంవత్సరానికి బీఈడీ కోర్సు ప్రవేశాలను అక్టోబ‌రు 14వ తేదీ నుంచి ప్రారంభించనున్నట్లు తెలిపారు. 2. విశ్వవిద్యాలయ ప్రాంగణంలో ఈ కౌన్సెలింగ్‌ ఉంటుంది. 3. రెండు తెలుగు రాష్ట్రాల్లోని పది కేంద్రాలకు సంబంధించిన ప్రవేశాలు హైదరాబాద్‌లోనే నిర్వహిస్తారు. 4. విశ్వవిద్యాలయం నిర్వహించిన ప్రవేశ పరీక్షలో ర్యాంకు సాధించిన అభ్యర్థులే ప్రవేశానికి అర్హులు. 5. అభ్యర్థులు తగిన ధ్రువపత్రాలు, రుసుము తీసుకొని హాజరు కావాలి. 8. 16న ఉదయం 9 గంటలకు సాంఘికశాస్త్రం కౌన్సెలింగ్‌ నిర్వహించనున్నట్లు తెలిపారు. ఇతర వివరాలకు వెబ్‌సైట్‌లో సంప్రదించాలని సూచించారు. MEd/ BEd/ BEd(SE) applied candidates were checked their entrance test results and they are waiting for their admission counselling dates for admission into programmes. Now BRAOU has announced MEd/ BEd/ BEd(SE) counselling schedule for admission into above said courses for the academic year 2018-2018. The counselling dates and more details are provided here. Prof. G.Ram Reddy Marg, Road No.46, Jubilee Hills, Hyderabad-500033. The counselling for admission to B.Ed Programme for the academic year 2018-19 is scheduled to be held on the following dates at University Campus, Jubilee Hills,Hyd. In this connection the Eligible Candidates are informed individually through letter and SMS. a candidate who has completed NCTE recognized Teacher Education Programme through FACE-TO-FACE mode, are only eligible for admission into B.Ed. ODL Programme. Without any one of the above eligibility/qualification your candidature will not be considered for admission counselling. With reference to your application for admission into B.Ed. (SE) ODL programme, we wish to inform you that you are provisionally selected for the Counselling for Admission. You are required to attend the Admission Counselling at your own expenses on ......... at 10 a.m. sharp in the Conference Hall, Academic Building of the Dr. B.R. Ambedkar Open University, Hyderabad. We have called candidates in the ratio of 1:3 for Admission Counselling. So, it may be noted that this call letter for Admission Counselling may not automatically entitle you for a seat in the Programme. The admission is subject to availability of the seat at a programme centre. The candidate should satisfy the eligibility criteria laid down in the notification and prospectus. The admissions are subject to the rules of the Government, RCI and the University. Candidate must submit the following documents in ORIGINAL at the time of Counselling. Candidate should SUBMIT the following documents in ORIGINAL at the time of Admission Counselling. Colour Photographs need to be submitted at the time of Admission. Note: Total Programme Fee is Rs. 30,000/- (Rupees thirty thousand only). Candidate may be permitted to pay Programme Fee in Two instalments, on request and submission of undertaking. If so, the Candidate has to bring A Demand Draft drawn on any nationalized Bank preferably SBI for Rs.15, 000/- (Rupees fifteen thousand only) drawn in favour of The Registrar, Dr. B.R. Ambedkar Open University, Hyderabad Payable at Hyderabad for admission counselling. SBI Branch is available in the University Campus. The Second Instalment Fee Rs. 15,000/- (Rupees fifteen thousand only) has to be paid to the University immediately after completion of Second Semester examination by the candidate. If, it is found that the admission is on false grounds or suppression of facts, the admission will be cancelled at any time during the course and the candidate is liable for criminal prosecution. If selected, the Programme centre will be allotted at the discretion of the Director (SS), giving due consideration to the choice of the candidate as far as possible.